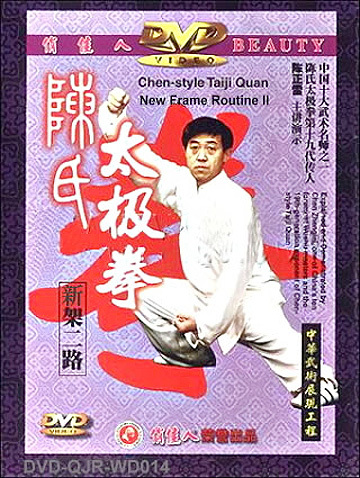 • Chen-style Taiji Quan New Frame Routine II is also called Cannon Hammer. It is in contrast to Routine I. It takes pick, separate, elbow and stick as its main movements and crack, stroke, squeeze and press as its auxiliary movements with hardness dwelling in softness. The whole play is forceful and explosive. You stamp your feet to apply force and you dodge and turn, rush and jump quickly and naturally. The player is like a fierce tiger jumping down from a hill; a dragon jumping out from the sea and a powerful lion shaking his hair. Exercise requirements: The body leading the hands, agile footwork, stable position, harmonious force, high-spirited, inflexible and fierce attack. This product was added to our catalog on Thursday, November 22, 2012.